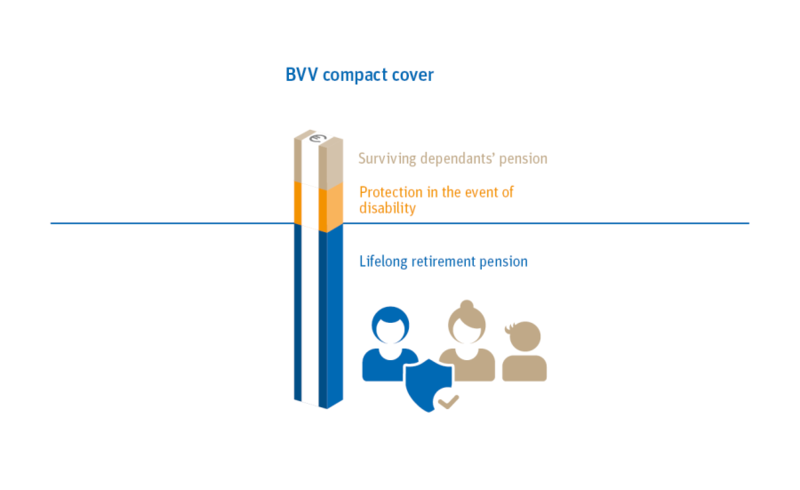 Your BVV pension plan combines tax advantages with our excellent tariffs. Are you an employer? We also provide brief English information for you. In the finance sector, occupational pension plans are often salary-linked and jointly financed by the employer and employee. Depending on the rules agreed upon by BVV and your employer, in most cases you will automatically be registered at BVV by your employer. An annual pension statement will give you an overview of your benefits. The government offers tax benefits: Contributions are generally paid from the gross income by deferred compensation, and are largely exempt from income tax and social insurance contributions for the employee. Pensions are paid out worldwide and will be taxed during the retirement phase. >> If you pay 200 euros into your pension plan, you only invest approximately 100 euros from your net income. 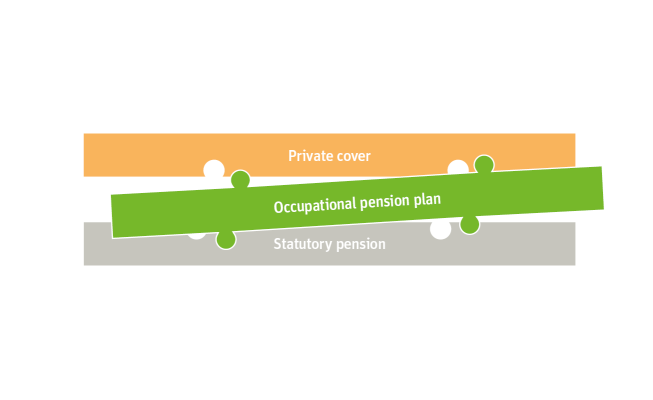 In addition to the statutory pension insurance, your employer will offer you an occupational pension scheme by BVV. 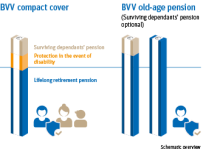 Details such as the chosen tariff and the amount of the contribution depend on the employer's agreement with BVV. The employer will pay a wage-based monthly contribution to BVV. You as the employee may participate in the payment by way of deferred compensation. Each contribution will be credited to your personal BVV pension account. You can increase your retirement pension individually, profiting from tax benefits and our excellent tariffs. Again, the tariffs offered by your employer may differ from the BVV product range displayed. The deferred compensation scheme is financed by you as the employee only. 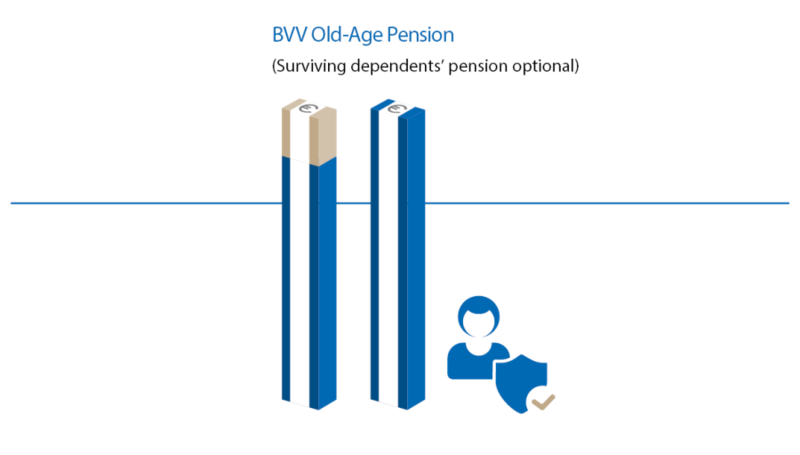 There are even more options to increase your BVV pension. You can pay contributions without involving your employer. That is possible if you already have a BVV pension account. When leaving the company, you have the opportunity to increase your entitlement to benefits with your new employer (if they are located in Germany) or from your net income. Sign agreement with your employer. Employer signs you up at BVV. Be a member of BVV. To arrange an individual consultation for your deferred compensation, simply select your desired date and time with the appointment calendar – our pension experts will call you on the time chosen. Please indicate if you wish to receive advice in English.